1911 photograph of Mildred Pratt of Bath, Maine, taken by Holmes Studio, Bath, Maine. 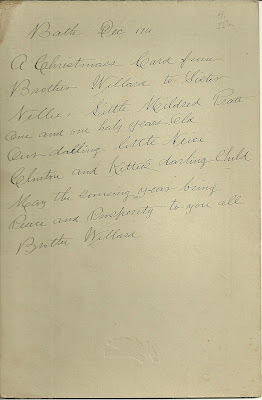 The photograph was used as a Christmas card by Willard Oliver to his sister Nellie. Written on the back of the photograph: Bath, Dec. 1911. 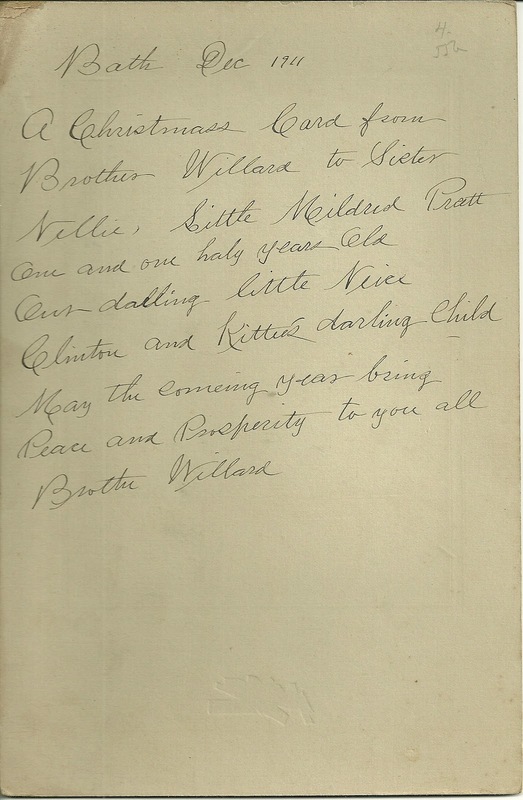 A Christmas Card from Brother Willard to Sister Nellie. 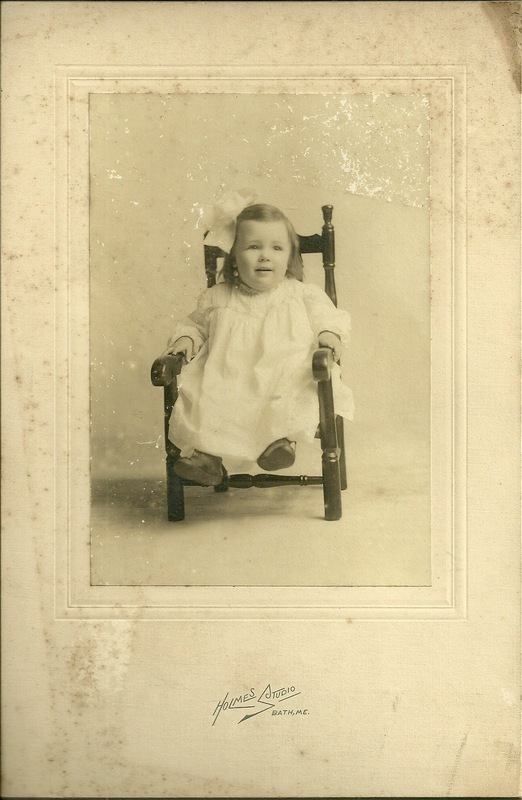 Little Mildred Pratt, one and one half years old. Our Darling little Niece. Clinton and Kittie's darling Child. May the coming year being Peace and Prosperity to you all. Brother Willard. Mildred Pratt was born about 1910 in Maine, the daughter of Clinton Fielding Pratt and his wife Kittie B. (Larrabee) Pratt. I don't have the names of Clinton's parents, but I believe his mother was Ida M. Oliver, the younger sister of Willard and Nellie (Oliver) Erskine, judging from the clues on the reverse of the photograph. Willard and Nellie had an older sister, Lena, but she married Louis Genthner and raised her family in Massachusetts. 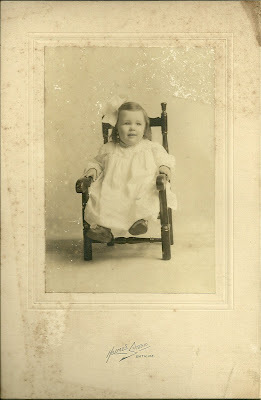 Kittie (Larrabee) Pratt was born about April 1886 in Minnesota, the daughter of Walter and Minnie (?) Larrabee. By the time of the 1900 Census, Clinton Fielding Pratt was living with his grandmother Philena (?) Oliver and uncle Willard in Bath, Maine. I don't know what had happened to his parents. Clinton Fielding Pratt and Kittie B. Larrabee married 17 July 1909. I don't know if they had other children, in addition to Mildred. In the 1910 Census, Clinton and Kittie were living with daughter Ruth M. in Bath, Maine. I'm assuming that the initial M. stood for Mildred, but I can't be sure. She could have been Ruth Mildred Pratt or Mildred Ruth Pratt, or neither. By the 1920 Census, Kittie had apparently divorced Clinton F. Pratt and was living with husband Gordon F. Preble and her daughter Mildred Pratt in Woolwich, Maine. In 1920 Clinton Pratt married Bertha M. Crosman and had at least two more children with her. As for Mildred Pratt, I lost track of her with the 1920 Census. Interestingly, I found an entry in the Maine Marriages online database for the marriage of Mildred F. Preble of Bath, Maine, and James F. Cameron of Ohio, in 1928; and another for Mildred F. Preble of Bath and John H. Stuart of Bath in 1935. However, if our Mildred is Mildred Ruth or Ruth Mildred, she wouldn't have the initial F. Never say never, though. I am Roy Edward Stuart the son of Mildred Fielding Pratt Preble. I was a triplet (Roy Edward, Ruth Audrey and Ruby Faye Stuart) born on September 2, 1940. My mother was, in fact, married to both James F. Cameron and John Henry Stuart. Your information appears to be very factual and accurate. Mildred had two children by James Cameron (James R. Cameron and Virginia Cameron (Wilson). I also have one sister, Mary Elizabeth Stuart (Bissinger) living in Bath, Maine (along with Virginia Wilson). My son, Richard Stuart, has responded to this posting and is kind of the family genealogy specialist. Please feel free to contact either of us for further information. My email address is roystuart11@comcast.net. Thank you for your comment, Richard, and for confirming the information. This isn't my family but hopefully a cousin previously unknown to you will see your comment at some point and connect! My grandmother was Mary Elizabeth Pratt according to my mother's birth certificate. I was given up at birth so I am the "family secret no one talks about". I wish I knew more but it has been requested I have no contact with the family.